HAPPY OCTOBER! I’m probably a bit too excited for Fall this year. 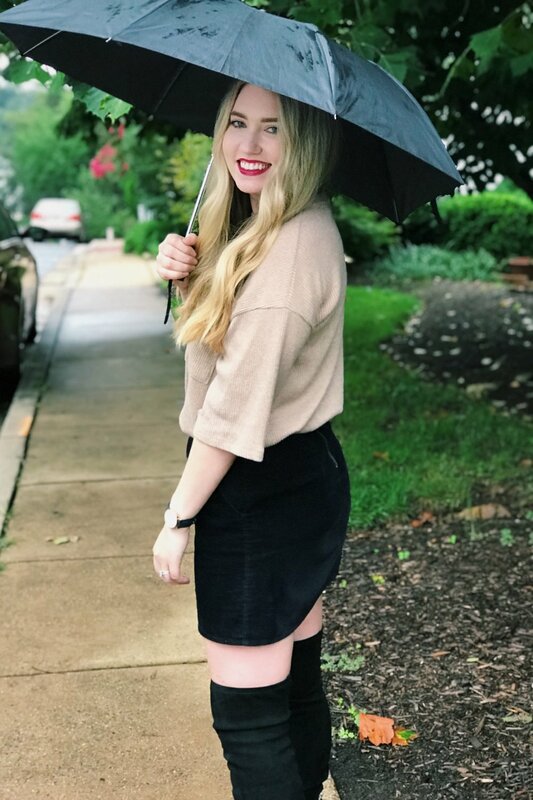 I’m excited to experience Fall in DC for the first time!! Fall is just so cozy. Sweaters, boots, beautiful leaves, hot chocolate, and puppy snuggles are what Fall is all about to me. My little brother is visiting me this week, and my mom’s birthday is next week! So far, October is looking good from where I’m sitting!! The weather here has cooled down a lot, but definitely not enough for me to jump straight in to a chunky sweater, jeans, and booties. 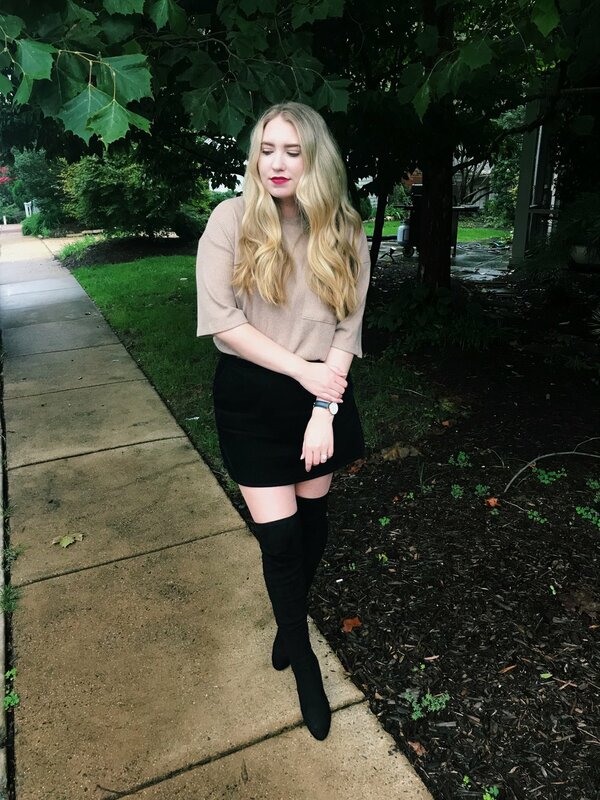 This outfit is a good way to transition into Fall. 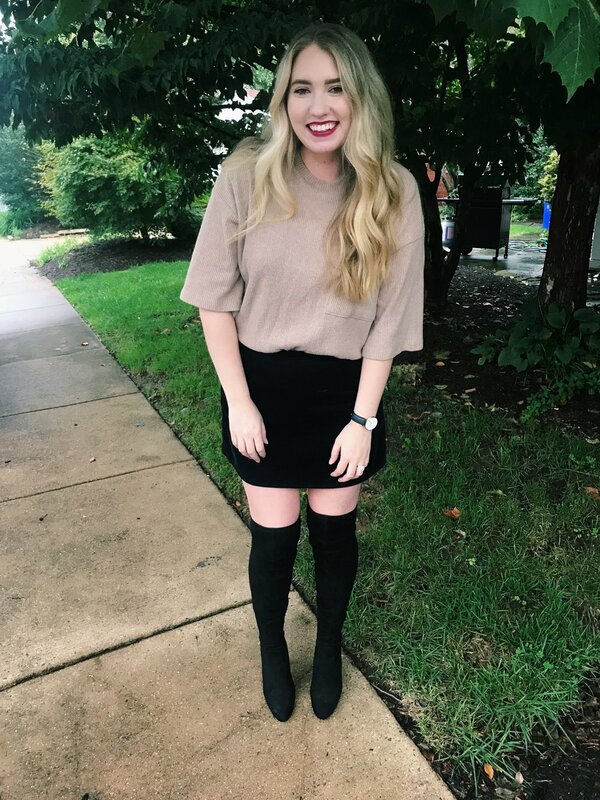 A light sweater (in my case, a short sleeve sweater), a corduroy skirt, and over the knee boots still let me live all of my Fall dreams without dying of a heat stroke! All of my Arkansas people understand where I’m coming from haha! I got the short sleeve sweater I’m wearing from a boutique in Arkansas last Fall, so I’ll be linking similar sweaters! A little side note about the boots: THEY DO NOT STAY UP!!! When I bought these, I really wasn’t into the look of the over the knee boots with a tie in the back. Now I realize how important it is to be able to tie your OTK boots in the back!!! I, of course, bought two colors of these boots, so now I’m stuck with boots that I love, but that slide down my legs haha! I definitely recommend finding a pair that tie in the back. I feel like my legs are a very normal size, so I’m thinking these will fall down on basically everyone!!! Just a warning!